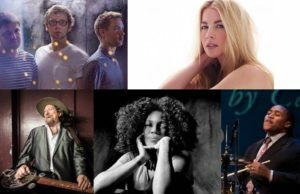 The Victoria Jazz Society has announced Gogo Penguin plus Gwyneth Herbert, Morgan James & Jamison Ross, Macy Gray, and The Jerry Douglas Band as headliners for the TD Victoria International JazzFest 2018. They join Dee Bridgewater & The Memphis Soulphany, Spanish Harlem Orchestra, and St. Paul & The Broken Bones as headliners in the festival’s Marquee Series at The Royal Theatre and The McPherson Playhouse. TD Victoria International JazzFest 2018 takes place Friday June 22 through to Sunday July 1, 2018. The complete lineup will be released in mid-April. For ticket info on the added headliners, see our concert calendar or click the links below.